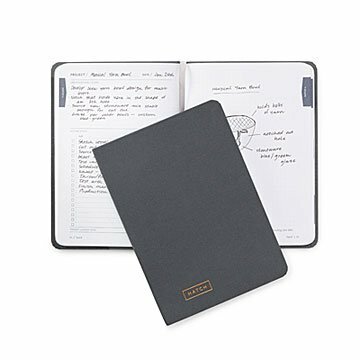 This handsome, hardbound notebook is designed to help you bring your creative ideas to life. Hatching your next big idea doesn't have to involve a flurry of Post-It notes or coffee-stained napkin sketches. Designed to help you transform daydreams into reality, this handsome, cloth-bound notebook is organized in three sections: Conceive, Incubate, and Hatch. The system breaks down grand ideas into realistic action items, offering a framework for brainstorming, tracking ideas, evaluating their merits, and deciding which ones to pursue and execute. Whether you're making something for the sheer joy of it or planning a product to sell, this notebook will help bring your ideas to life while strengthening your creative capacity along the way. It includes detailed tips and guidelines for how to make the most of each section, a ribbon bookmark to keep your place, and inspirational quotes to keep you motivated. Printed on 70 lb. acid-free paper sourced from sustainably managed American forests. Designed by Liz and Sarah Downey; made in Ann Arbor, Michigan. "We're inspired by a desire to find a solution to a challenge in our own lives," says Sarah Downey. Originally from the Midwest, Sarah and her sister Liz tumbled through many locations, hoping they would eventually land in the same place so they could combine their talents. Their hopes paid off and they now work together to create unique, well-designed lifestyle products that have a positive impact on the world. Click here to see the inside of the notebook! I love how Uncommon Goods has beautiful and unusual gifts.